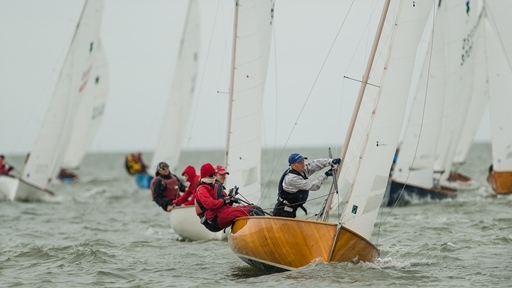 The Thistle Fleet at SSA enjoys an active racing schedule, from events with top-notch local competition to regattas drawing leading skippers and crew from the East Coast and the Midwest. From their start on the Great Lakes in 1945, Thistles are now raced in more than 100 active fleets from coast to coast. The national Thistle Class Association is regularly recognized as one of the strongest and best organized one-design groups in the country. Owners have proven their great loyalty to the Thistle, as many top sailors represent the second or third generation of Thistle families. Thistles are raced in four fleets in the Central Atlantic District: Annapolis, New Castle, Baltimore and Richmond. The SSA Fleet is competitive locally and is well represented at regional and national events, with fleet members regularly finishing in the silver. The strength of the Fleet lies, of course, with the Thistle itself. This large lightweight planing dinghy out-performs most in drifters, and is a real experience planing flat-out, with spinnaker flying, on a heavy-air reach. This makes the boat an almost ideal choice for the Chesapeake region. The Thistle is a strict one-design class, and it can truly be said that old and new boats perform evenly. The 44-year-old Thistle #1 won the National Championship in 1990, followed by a 15-year-old boat, with a new boat in third place. The Fleet's events range from the annual Midwinter Championship in St. Petersburg, Florida, through a series of local and interdistrict spring, summer, and fall regattas, culminating with October's 25-plus boat Oyster Roast Regatta at SSA.